Event: Ariel Experts VS 100 Challenge: I was confused which was old and which was new! I was totally confused and chose the wrong shirt. I thought I was good at determining new clothes from newly-washed but the Ariel Experts VS 100 Challenge held today at Teatrino, Greenhills confused me with two shirts just like Boy Abunda. The two shirts really seemed new when I checked before entering the event. I just chose A as the new shirt as a wild guess (and I was wrong). The event was so exciting as all the participants were given keypads to answer the questions like the famous game played on TV. Clothing experts, Metropole Laundry and Dry Cleaners, Inc and Bench played against the 100 media participants answering questions on laundry, fashion and in trying to identify which is new shirt from old shirt washed and stained 10 times with Ariel. Both clothing experts also had a hard time determining which was new and which was stained and washed 10 times with Ariel because it has Oxybleach system that removes tough stains so well (even without scrubbing with a bar and brush). Ariel can give clothes the care it needs to keep looking like new. I can vouch this being true because I've been using Ariel for 4 years now. My son's white polo shirt gets stained everyday with food he eats at the canteen of the university. I usually dissolve Ariel powder in water and let the polo shirt soak for an hour before I turn on the washing machine. I wasn't aware that Ariel now has a liquid formula you can dip your fingers on and wipe on stained clothes and soak for a few minutes for better stain-removal results. 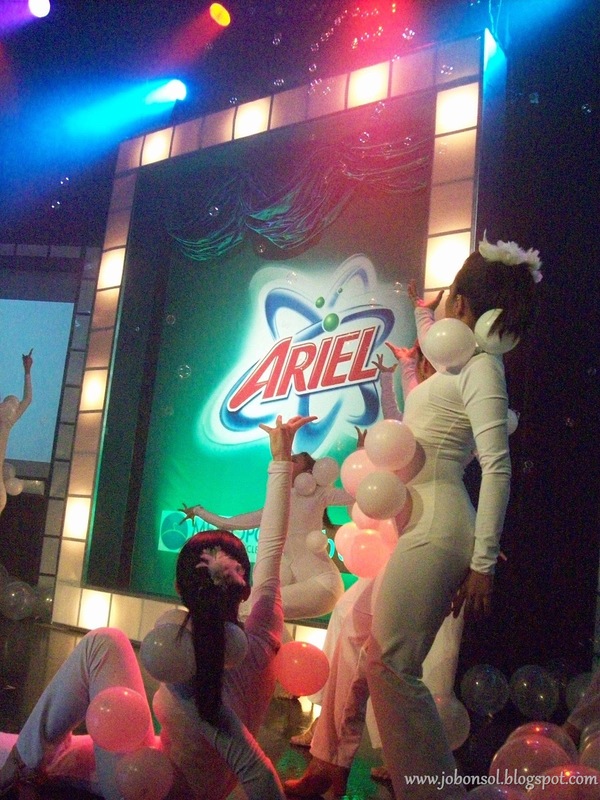 Ariel has Oxybleach Anti-Stain with Rings now to prevent wear and tear of clothes scrubbing with bar and brush. This bleach contains a bleach activator which decolorizes and removes the stain in the wash, plus photo-bleach activated by sunlight during drying to provide additional bleaching effects. Ariel Oxybleach also has enzymes that reduce "himulmol" preventing future stains from sticking to your clothes. I know that Ariel works because I've trusted it for years now but I wasn't aware that it can protect clothes with all these features. Now, I am more interested to wash clothes with Ariel Oxybleach Anti-Stain with Rings. Take the challenge and stain and wash your clothes 10 times and see what happens! Remember, 8 out 10 women could not even tell the difference! 1.Event: Downy unveils Passion and Attraction luxurious scent!